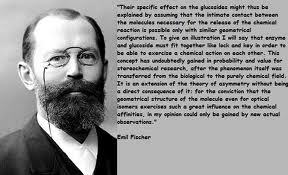 Organic chemist Emil Fischer studied under Adolf von Baeyer, spent most of his career studying the chemistry of purines and sugars, and won the Nobel Prize in Chemistry in 1902 — the same year he identified the peptide bond that holds together amino acid chains. He discovered phenylhydrazine (perhaps accidentally) in 1874, explored the organic derivatives of hydrazine (a compound of nitrogen and hydrogen, heavily used in dyes), and his work provided the first detailed understanding of caffeine and theobromine, principle ingredients in cocoa, coffee, and tea. In 1888 he showed the chemical relation between glucose, fructose and mannose, and in 1903 he synthesized barbituric acid (the first barbiturate), allowing the development of affordable sedatives for insomnia and anxiety. In 1919, suffering from cancer and deeply depressed over the deaths of two of his three sons in World War I, he took his own life.